I had a good day,” Summerdale, Ala., cutter Austin Shepard said Tuesday night after advancing four horses to the Augusta Futurity Open finals, to be held Saturday night. Shepard swept the top three spots with horses sired by High Brow CD, the stallion he rode to win the 2008 National Cutting Horse Association Futurity Open. The fourth horse, sired by One Time Pepto, notched the first round’s seventh-best score. Shepard headed into the 35th annual Augusta, Ga., limited-age cutting as the show’s fourth all-time top-earning rider, with $315,570 earned. He will almost certainly climb into third place, and has a shot at second, by the end of the week, as he also qualified three for Friday’s Classic Open finals. In the 4-Year-Old Open go-round, Shepard marked dual 220s with the mare Gini One Time, bred and owned by Gary and Virginia Dellinger, of Catawamba, N.C., and the newly-gelded Big Daddys CD, bred and owned by Mike and Elizabeth Bowman, of Simpsonville, Ky. Shepard also posted a 217.5 with Circle S, a gelding he bred and owns with his wife, Stacy, and a 215 with CD Kual Gun, a gelding owned by Kayla Norris, of Hattiesburg, Miss. It took a 213.5 to advance. Stacy Shepard and Circle S, who is out of the Shepards’ standout broodmare MH San Tules Dually, were Southern Futurity Non-Pro Champions last October. They will compete for the first time since then in Friday’s first go of Augusta Futurity Non-Pro. 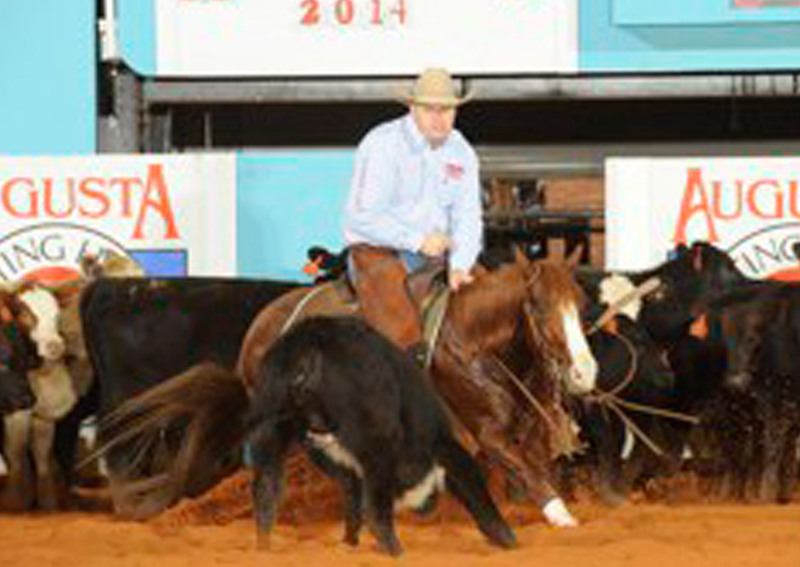 Norris and CD Kual Gun (One Time Pepto x Kual Gun x Playgun) won the NCHA Futurity Unlimited Amateur in December. They were scheduled to compete in Wednesday’s first go of the Augusta Futurity Amateur, and are also entered in the Non-Pro. Gini One Time, went to the NCHA Futurity with Shepard and was shown by his father, Sam. They missed making the Open semifinals by one-half point. This is the first time that Shepard has competed with Gini One Time at a limited-age show. Big Daddys CD is out of Snazzy Easter Bunny, a horse Shepard enjoyed riding several years ago. Big Daddys CD competed as a stallion with Shepard at the NCHA Futurity, but did not make it past the first round. The horse left Texas as a gelding. Always a talented horse, he’s competed with much more consistency early this year, Shepard said. Heading into the Augusta Futurity Open finals with these four horses gives Shepard a certain level of comfort and pride.